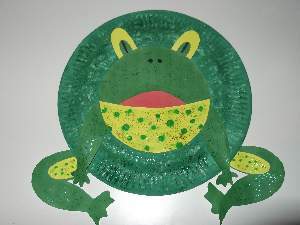 Here is a paper plate frog to add to your wall collection. He`s green, mean, but far from lean, and you can make him very quickly. Get the paints out! Not unless you have a pack of those paper plates that come in various colors and sizes. 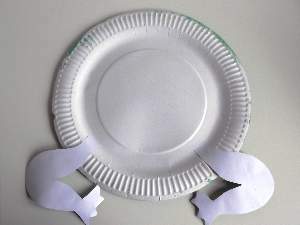 Turn the plate over with the bottom facing you and paint around the outside. No need to paint the middle as it will be covered. After looking at the above picture for a while I did not know if it was the front or the back of the plate. So be careful of this optical illusion. The underside of the plate is to be painted. 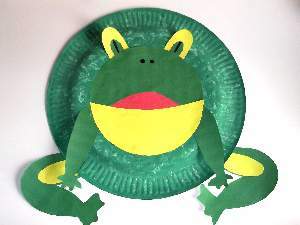 While it dries, sign up for our newsletter and free printables to print off this sheet with the paper plate frog parts and cut out the individual pieces. 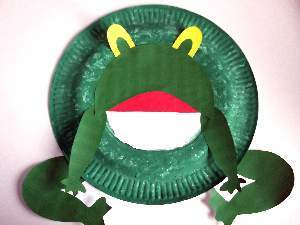 Use a thin white card or paper, but if you want to make your frog different colors, use the cut outs as patterns on whatever colored card takes your fancy. 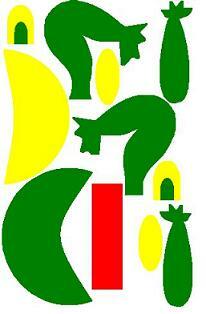 Download just the outline version of the frog parts if you want the children to color them in. This was a request from a subscriber who wanted to download and print for a whole class but the printing would cost on ink. It`s a great idea and more fun for the kids! If the plate is dry, turn it back over and stick the back legs on. They are the largest limbs. Make sure you stick the green sides face down or they will be showing the white side when you turn it back over. The optical illusion is strong in this picture too. The plate is the right way up. The red strip is for the inside of the mouth. Stick this in the center. The eyes and front legs can be fixed at this stage. 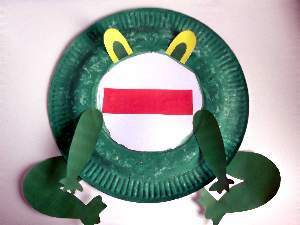 The arms should be stuck pointing down wards just below the corners of the frog`s mouth, so measure the half way mark on the plate and glue them in place. See the picture. 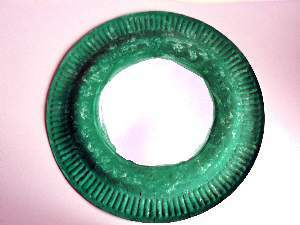 Take the green moon-shaped part and stick it on first. It should fit nicely into the inner circle that you left unpainted. Make sure it covers the edges of the eyes. The yellow moon-shaped part is the frog`s throat. Fit this snugly into the bottom half of the circle. It`s corners should just cover the top of the arms. Can you see the yellow under-side of his legs? To make those just stick the yellow oval shapes on both thighs. Stick them near the bottom edges. Lastly draw the nostrils in with a black pelt-tip pen or a marker. You can make some patterns on your frog or blotches if you like. Also green or white glitter will give it a wet look. Croak!